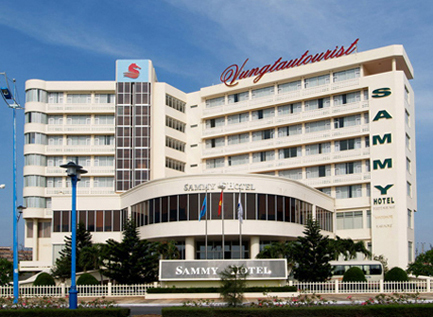 Located right on Thuy Van Boulevard full of romance and a spreading seashore (so-called Back Beach) full of sunshine, Sammy Hotel like a peaceful oasis waiting for the discovery of close and far tourists. With an ideal location, together with its French artchitectural harmonious design, the Three-star Sammy Hotel shall certainly bring to your satisfaction . Excellent food, green and cool settin,wholehearted working spirits… we are ready to welcome all of you. With experienced staff, plentiful menus, special prices, we are willing to offer professional advice in organizing weddings, events and designing banquet menus appropriate to your demands. With the perfect audio – system and luxurious & up-to-date interior decoration, you can create for yourself a unique manner. With several types of Karaoke rooms in corresponding to different demands and all ages and together with our professional audio-technical staff that we can be ready to be at your service ,at any time.